Periodontal disease in pets occurs when plaque film and tartar (hardened plaque) build up on the teeth both above and below the gumline. This accumulation irritates the gum tissue and allows bacteria to flourish, leading to damage of the supportive structures of the teeth, which are the gums and the fibrous connective tissue that connects the roots of the teeth to the surrounding alveolar bone. Significant pain, oral infection, bone and tooth loss, and even systemic damage can occur as a result of untreated periodontal disease. Stage 1 – This early stage is characterized by gingivitis, which is inflammation of the gums in response to the presence of tartar and bacteria. You may observe some swelling of the gums. A thin red line on the gums next to the teeth may also be visible during this stage. Stage 2 – Also known as early periodontitis, this stage occurs when there is a small amount of bone loss – less than 25% – visible on oral radiographs. You may notice inflammation of your pet’s gums, bad breath, and some visible plaque and tartar. 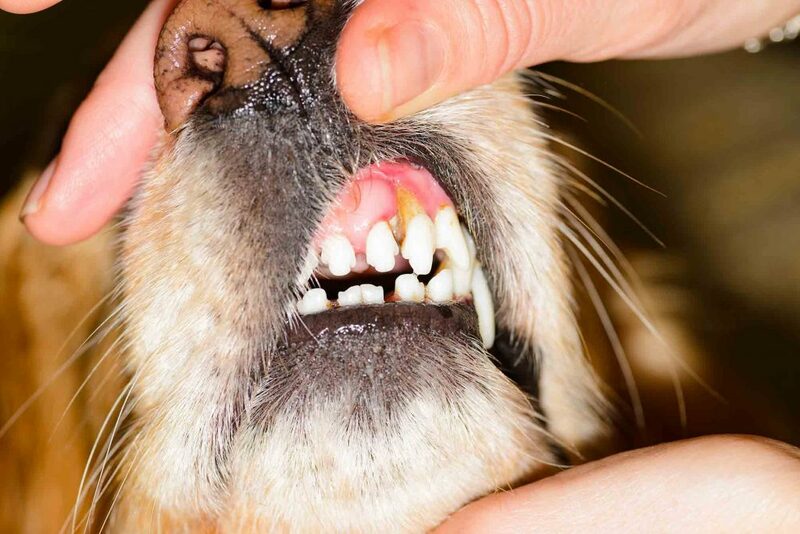 At this point, your pet will need a professional cleaning to thoroughly remove the plaque and tartar, and to reverse the progress of dental disease. Stage 3 – Serious dental damage begins to occur at stage 3, also known as moderate periodontitis, when 25-50% bone loss is visible on oral radiographs. Gums will be swollen and irritated, and probably bleed easily. There is loss of gum attachment to the tooth, forming areas known as periodontal pockets. Your pet may also experience bad breath and significant pain, and need to have infected and/or damaged teeth removed. Stage 4 – Extreme, chronic periodontal disease is evident in the 4th and final stage, where bone loss of 50% or higher is visible on oral radiographs. Your pet is not only in severe pain, it is at risk of losing multiple teeth, as well as systemic infection and damage to internal organs, due to bacteria from the mouth entering the bloodstream and spreading throughout the body. An oral examination is an important part of your pet’s annual wellness exam. A thorough look into your pet’s mouth, combined with your report of any symptoms or problems you have observed, will help our veterinarian determine the next step in your pet’s oral care. Most pets require regular cleanings performed while the pet is under general anesthesia in order to ensure the health of their teeth, as well as to correct any problems caused by periodontal disease. Regular teeth brushing at home is also an essential part of your pet’s ongoing oral health maintenance program, and takes just a minute a day to accomplish. Your veterinarian will be happy to demonstrate proper brushing technique and answer any questions you have regarding dental disease and your pet. Daily brushing, combined with checkups and dental cleanings when needed, will help your pet have a healthier and more comfortable life. As always, your team at Lone Tree Veterinary Medical Center is here for you and your pet! Don’t hesitate to contact us to schedule your pet’s next visit.